Sometime during the night they had entered her room as she slept and had awakened her by bouncing on her feathery pillow. Now she watched them in amazement as they danced around the bedroom, performing amazing acrobatics and hilarious stunts. She still was not certain who (or what) they were. These tiny babies with sprouting blue wings just above the shoulders were sent, it seemed, just for her amusement. They had the thinnest wisps of hair that stood straight out--like that of a baby who had been sleeping for some time. Their tiny starfish hands reached out teasing and amusing her. Being so plump with their protruding tummies they looked like mischievous children running and hopping and falling down. Their eyes were big laughing ones, making her love them and long to hold them. As if he knew her wishes, one of these irresistible children jumped onto her hand and looked Lovingly into her own large eyes. This surprised her and she simply stared at the little creature for several minutes. Then she discovered something that was even more astonishing--when the baby sat down in her hand, she found that he had a cold bottom. These weren't real babies or they would be warm all over--these were some kind of fairy or elf. As she again watched them playing and frolicking on her bed and about the room, she knew what they were. They were Kewpies. This was Rose O'Neill's dream one lonely night in the early 1900's From this experience the Kewpies were born in her imagination and she later began drawing them. There were several reasons given for her dream of these happy, carefree babies. One says that she was very heartbroken over the failure of her second marriage and the Kewpies gave her a way to make all things perfect again. Another and perhaps the most accepted is that she loved children, especially her several smaller brothers and sisters. The Kewpies were created by inspiration of her baby brother whom she cared for much of the time. Rose called the tiny fairies Kewpies because she said that was short for Cupid. "Cupid gets you into trouble and the Kewpies get you out." The purpose of these elves is to do good deeds in a funny way. Often in their episodes they are seen helping orphans or princesses, weeping children or mean boys. Always they make the reader laugh. 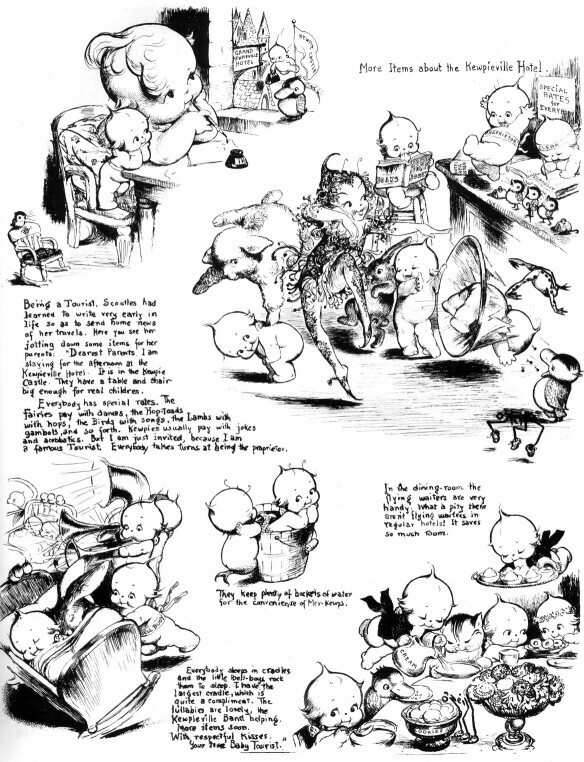 The Kewpie drawings first began appearing in the Ladies Home Journal for which Rose was an illustrator. The December 1908 issue featured the first of the famed sketches. For several years afterward the "Kewpie Pages" were regular features in such publications as Good Housekeeping, deineator, and Woman's home Companion. Kewpie pages were entire pages of the drawings accompanied by a short story or prose. Every child looked forward to the next issue and when it arrived, hurriedly found the Kewpies. These blue-winged babies became well loved by everyone and their adventures made the public laugh again. Miss O'Neill let the children help her create adventures for the Kewpies. The youngsters would write letters suggesting funny episodes for her drawings. Kewpies were seen flying in planes, having parties, studying in college, swimming with mermaids, helping fairies and turning themselves into dolls. Later Kewpieville became the setting of Kewpie adventures. This was their town, with city gates and walls, a castle, a police force, marble statues and fountains everything a proper village should have. The leader of this happy little community was Chief Wag who kept friendly chaos among the inhabitants. The Gardener planted colorful flowers, cleaned the streets and kept things neat. The Carpenter was always near to lend a hand in any new building project and the Cook could always stir up something special for the tastes of all. Other residents included the lovers, Katy O'Kewp and Johnny McKewp and Uncle Hobgoblin with his two mischievous goblin nephews. Scootles was a real baby who scooted away to find adventures and was often referred to as the Baby Tourist. She was a frequent visitor of Kewpieville and while there resided at the Grand Kewpieville Hotel. In one adventure Uncle Hobgoblin didn't trust Scootles and put her in the town jail. There she became very good friends with Katy O'Kewp whom Uncle Hobgoblin had chained in the jail to keep her away from Johnny McKewp. But through the diligent efforts of the Kewpies, both were released and lived "happily ever after." As the drawings became more familiar, Rose O'Neill next created Kewpie Kutouts. These paper dolls featured in several magazines were different from all others, for they had both a front and a back side. 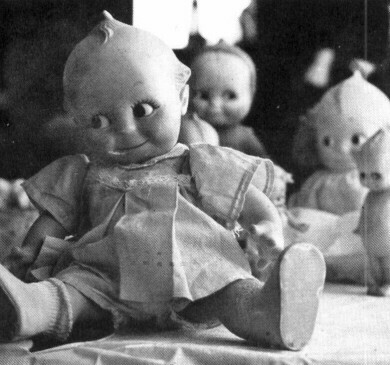 Along with the Kutouts were stories that children could have the Kewpies re-live as dolls. Several new characters were introduced as Kutouts including Life Preserver Kewp, Careful of His Complexion, Blunderboo, Kewpiedoodle Dog and the Instructive Kewpie. Comic pages and books were next developed. The comics, colorfully framed segments featuring the Kewpies and Scootles were printed in several newspapers including one in New York. Rose wrote many books about the Kewpies including: The Kewpies and Dotty Darling; The Kewpies, Their Book; The Kewpie Primer; The Kewpies and the Runaway Baby, all of which featured segments from former Kewpie pages along with new materials. There were even coloring books for small children such as Scootles in Kewpieville and The Adventures of the Kewpies. 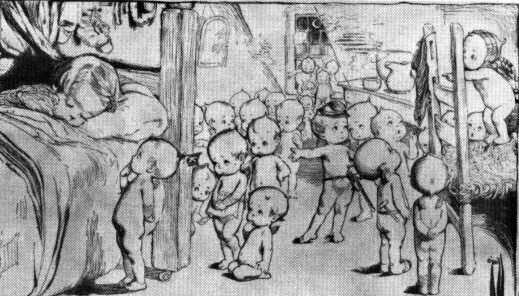 The Kewpies first appeared in the LADIES HOME JOURNAL in December 1908. This main section shows the Kewpies bringing toys to a poor girl for Christmas. Kewpie pages that were featured in many magazines brought laughter to thousands of people. Rose blended her signature into the drawing and usually ended the story with "Kewpishly yours, O' Neill." When children started wanting a Kewpie to hold, Rose began modeling the Kewpie Doll. They were first made in Germany at Rose's direction and by 1913 the dolls were all over the world. Rose supervised the making of the bisque (unglazed ceramic) dolls in nine different sizes, the smallest costing twenty-five cents. Miss O'Neill was very distressed at the poor quality of the smaller dolls and demanded they be made better. Her reason was that those would be the dolls the poorest children could afford and she wanted them to be the best. These first dolls had straight posture with their arms at their sides. They were also made from china and celluloid--a thin substance that was light weight and sometimes brittle. As the Kewpies grew in popularity, so did the different kinds, sizes and materials of the dolls. Action Kewpie dolls were made in different positions and with other objects. The first action Kewpie doll, the Thinker, was molded sitting with his elbows on his knees. This Kewpie was named for the famous sculpture by Auguste Rodin, "The Thinker," except the Kewpie isn't troubled by his thoughts but amused instead. Kewpies wearing hats, playing musical instruments, holding anything from ink pens to flowers or umbrellas, sitting in baskets, singing from books or doing almost any activity imaginable were formed into dolls. Rubber (above) and plush cloth (below) were two materials used in making Kuddle Kewpies. These two have rubber faces, also. Several Kewpies are displayed showing different kinds and materials (lower right). Wood pulp dolls were covered with a plastic coating and painted (standing at right). 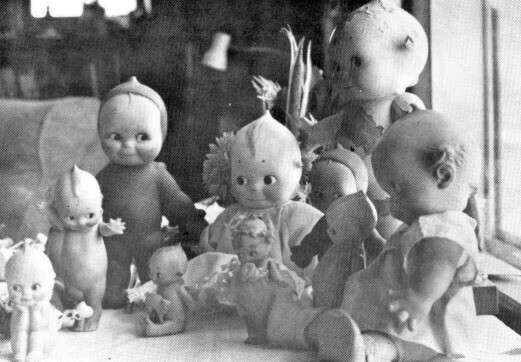 Celluloid (small shiny doll at right) and plaster (large middle doll) were major substances used to make Kewpies quickly and cheaply. The Thinker (extreme left) was the first action Kewpie. Kewpies were used in an almost infinite variety of ways. They were painted as designs on dishes, clocks, glassware and serving trays. Items such as salt and pepper shakers, hat pins, door knockers, ice cream molds and soap were formed into the shape of the Kewpie. They were embroidered or stamped on articles of clothing, on flannels, pillow covers, blankets, garters and placemats. The Kewpies were even used as the bride and groom atop the wedding cake. Their popularity was astounding and continued to grow as the years went by. It seemed as if the world was searching for something funny and something to believe in--it found both in the Kewpie. Rose O'Neill was born on June 25, 1874 in Wilkesbarre, Pennsylvania, her parents' second child. Soon after her birth the family moved to Nebraska, finally settling near Omaha. Rose's great love for poetry and the classics arose from her father's own appreciation. She showed artistic ability at a very early age and by fourteen had won her first contest--a drawing by a Nebraska school child which was featured in the Omaha World Herald. Rose's drawing was so skillful that she had to prove that it was her own. Only a few years later Rose began illustrating for magazines and newspaper publications. At nineteen she moved to New York, taking her first novel with her. Her writing was rejected, but her illustrations from the book were thought to show a great amount of talent. She sold them for five and ten dollars each. Miss O'Neill then studied in New York for three years at the Convent of the Sisters of Saint Regis. Not long after her enrollment her family moved from Nebraska to the Missouri Ozarks because her father, tired of city life, found solace in the beauty surrounding the Branson area. 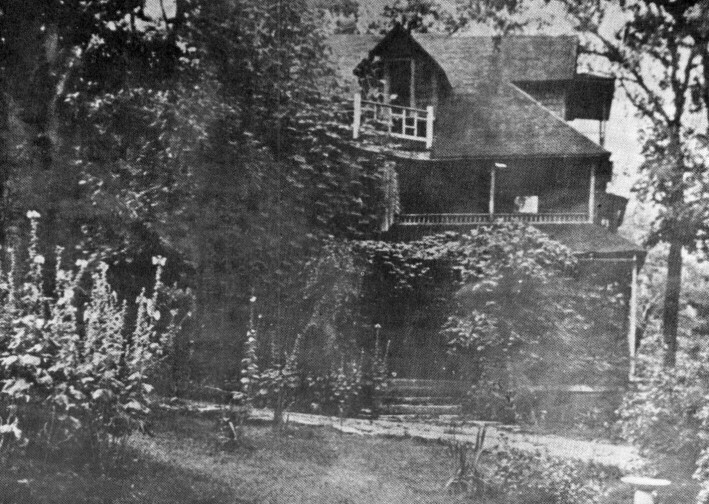 The three-story home of Bonniebrook was hidden deep in the Ozarks' forested hills, trickling creeks and menagery of animals. This mansion had started as two small log cabins and was transformed by Rose's older brother, Hugh, into the most beautiful home in the area. Under the house's many gabled roof the O'Neill family lived and worked. As Rose became increasingly more wealthy from her success, she furnished the home with elaborate accessories. Famous paintings, antique furniture and decorative rugs adorned Miss O'Neill's "retreat." Rose's statues stood on the grounds for several years until they were sold. The house looked as if it had been placed randomly among the hills after being uprooted from a large city. Rose O'Neill was a very beautiful woman in her day. Several things were written about her including the song, "Rose of Washington Square" by a ragtime composer in New York. The O'Neill home at Bonniebrook was filled with priceless treasures including two Napolean chairs and a column from Castle Carabas. 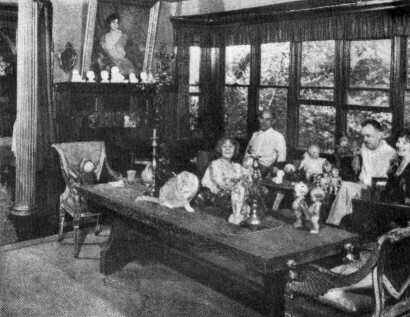 Seated in an elaborate room overlooking the Ozark hills are (from left to right): Rose O'Neill, Clarence (brother), Vance Randolph and Callista (sister). Chief Wag was the fearless and funny leader of the Kewpies. He wore a flag from his topknot which bore a capital K. Wag is a word meaning joker and this Kewpie was the Chief Wag. The Cook always wore an apron and sometimes carried a spoon. He was forever stirring up delicacies for any hungry little child. Rose wrote that, "He's most expert with ham and eggs." Wrapped in a woolen scarf, this Kewpie was Careful of His Voice. He stayed warm in the winter because of this wise practice. He and Always Wears His Overshoes were usually together. The Kewpie Soldier battled sobs and tears and every other unpleasant thing. He eliminated bugs and spiders from Kewpieville with his trusty rifle. Civil War and World War I soldiers were also among the Kewpie army. by why just drop in." 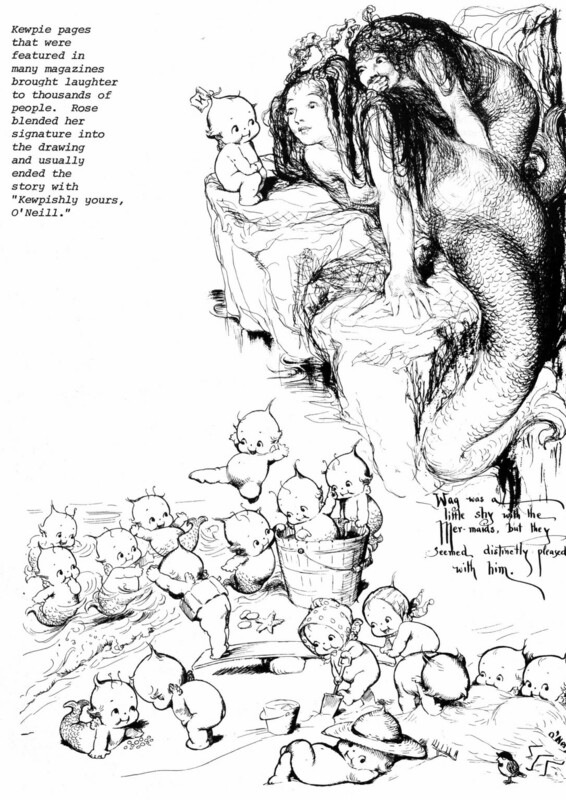 Rose wrote of these half mermaid half Kewpie creatures who were always near water. They were never made into dolls. Forever falling over himself and tripping, Blunderboo was the clumsy Kewpie. He slid down hills and rolled head over heels into the water. He won the children's hearts by tumbling down Miss O'Neill's easle. This little Kewpie had a green thumb for growing things. He was the Gardner, sometimes called the Farmer. He kept the streets clean and the town beautiful by planting flowers all around. He wore a straw hat and usually carried a rake or hoe. The Kuddle Kewpies were seen as drawings only just preceding and immediately after their being made as dolls. 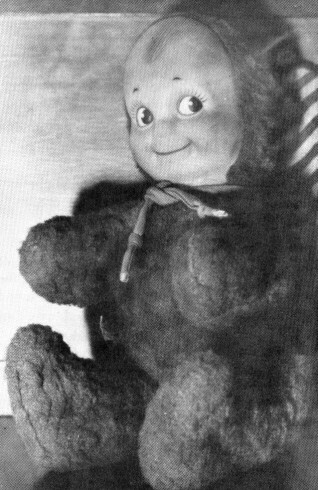 Kuddle Kewps had rubber or cloth faces and soft bodies. The polka dot sunbonnet kept this Kewpie's face smooth and white. He was cautious of sun and wind and was very Careful of His Complexion. 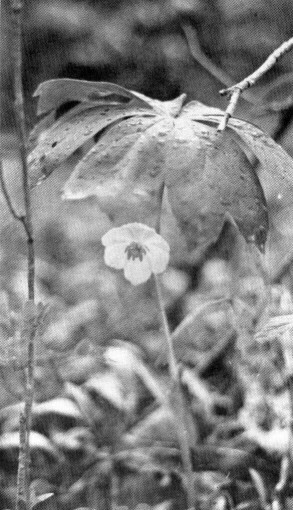 This daisy crowned Kewpie was Katy O'Kewp, sometimes called Kate or Daisy O'Kewp. She was the niece of Uncle Hobgoblin who often chained her in jail to keep her from her lover, Johnny McKewp. The Kewpie Carpenter wore a belt with a hammer which hung by his side. He was forever fixing things and building useful objects. He is also a good friend of Katy O'Kewp and sometimes walks arm in arm with her. Puts a town on the Map. The Kewpie Dog was modeled by Rose's real Boston terrier. When he first appeared in the Kewpie pages, he was an ordinary dog. Then in a Christmas edition the Kewpies gave him wings and called him the Kewpiedoodle Dog. Not wanting to catch colds, this Kewpie Always Wore His Overshoes. His feet were kept warm and dry, away from snow and ooze. He was good friends with Careful of His Voice. The neighbors of Bonniebrook loved and accepted the O'Neill's and their wealth of both material things and knowledge. These Ozark people seldom complained that Rose was proud or self-righteous, saying only that she was a generous and beautiful woman. Rose Merritt is one of these close neighbors that knew Miss O'Neill. This is her account of Rose O'Neill's Missouri life. "I was my parents' first child, and being a girl, they could think of nothing better than to name me Rose. And Rose O'Neill was thrilled to have me as her namesake. "The O'Neills moved to the Ozarks about the time that my great-grandparents moved here from Canada. They were neighbors on Bear Creek. Rose gave the name Bonniebrook to the property. She thought of it as a 'tangle' because it was so beautiful in the wooded area. She came through this wooded path and never dreamed that she would come into an area where she would see a home. Back in those days you had to go horseback. You could never drive a car right up to the door. The old wooden bridge which you had to cross, they used to laugh and say that it was the doorbell because you could hear the boards squeak. "Rose's parents established the home first. When Rose came from New York, she endearingly named me 'her little Rose' and to my parents she called herself 'the other Rose." The Bonniebrook vicinity has remained virtually unchanged over the past forty years. However, the house (above) burned and the site has been overgrown by trees and brush. The area is still a "tangle" with the "ragged rascal beauty" that Rose O'Neill loved. Bonniebrook flows into the larger Bear Creek (below) about one-eighth mile from the house site. Wild flowers like the may apple grow beside the narrow road along with varieties of domestic plants which have reverted to the wild. "My personal association would have to go back to the fact that my great-grandparents lived near by. The O'Neills needed more help in caring for the place and couldn't find it at the time. My grandparents lived near and were available, so they offered to stay as caretakers until the O'Neills could find someone. And it seemed that they loved them so that they stayed about two years. Rose never treated them as if they were caretakers, but as if they were part of the family. She loved everyone with all her heart. And no one had to look up to her. My grandparents were caretakers when my mother was ten and eleven years old. Rose would draw illustrations which perhaps she didn't like, so she would give the page to my mother and' let my mother draw along with her. She loved children, and my mother idolized her. "Later in Rose's life when she would come home for periods of time was when I was with her the most. We would go to the threater or go downtown to get an ice cream sundae or just visit together--that's when I could enjoy her most. When I was smaller, she would bring me gifts and give me special attention. Later I was able to really visit with her and to have her try to instruct me. She would visit in our home and play the piano and sing. She also visited when we would have garden clubs at my parents' home. She would go with us to garden clubs in other towns. She dearly loved flowers and everything beautiful. She called my parents the inspired gardeners. She always loved them. "Once Rose had a deadline on some manuscripts and the time was near. She contacted my father to find out when I would be home from college that summer and to see if I would be willing to come to Bonniebrook and stay with her and type some of her manuscripts. She could then rush them to her publishers. Evidently she did not type. I accepted and was delighted. It was a wonderful and unforgettable experience. I did go and I was given her sister Callista's boudoir for my room, which was near Rose's room. The family would go to bed rather early. She, of course, would go to her room and so would everyone else in the house. So I would read her books at night by a little lamp that I had by the bedside. That was my time to be alone. The rest of the time I was busy. I would get up in the morning and go downstairs early. Most of the time, rather than wait for her, I would eat breakfast in the kitchen with the caretakers. When I would go into the huge living room, where I used to sit at a big table and that is where I had my typewriter. I would type her manuscripts. Like all people who didn't realize what was going on at the time, when I made a mistake on what she had handwritten--what did I do? Throw it in the waste basket. I could just cry tears when I think of how much I would love to have those manuscripts today I did not realize they would be so valuable and mean so much to me now. 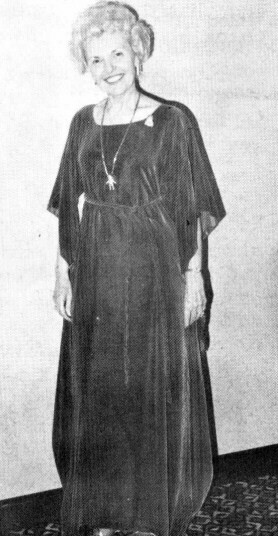 Rose Merritt, Miss O'Neill's namesake is dressed in clothing like Rose O'Neill normally wore--flowing red mantle, sandals and jewelry. She was a close neighbor of the O'Neills at Bonniebrook. 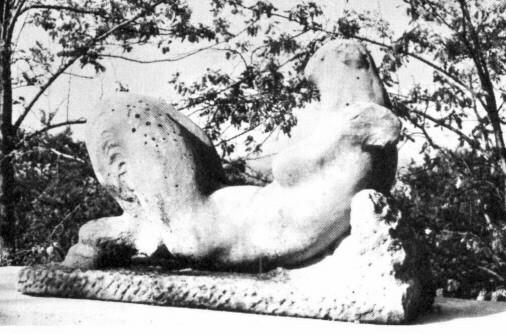 "The Fauness" by Miss O'Neill is a reclining creature with the feet of a goat, the body of a woman and only the suggestion of a face. "I can remember the many times when we would have lunch together. If the weather was nice we would sit on the porch. She had a big hammock that she would sit in and I would usually sit on a stool near her feet. We would have a tray to eat off of. Here would be where we would discuss things and she would try to guide me or lead me in seeing that I should not pick on myself but think about only the best of myself. That I must not try to be as my parents were, or someone else, but that I must be myself. Anything that would help anyone Rose was willing and anxious to help them. This is really how she gave all her fortune away, helping. She taught me that if I set a goal for myself that I could make it. But I think she influenced many, many people this way, I really do. "If Rose would see someone in need, she would go to them to help, even though she didn't know them. I have received several letters from people that tell of someone that was perhaps losing something because they couldn't pay the mortgage. In one particular case she heard that a piano was to be taken back and the people owed fifty dollars. Well, immediately she sent a check for fifty dollars so they could have that piano and keep it for the children. She did this for everyone. "Everything in her drawing is always where the Kewpies make it turn out all right. Whatever you have, if you have someone that's grumpy or someone who is unhappy, the Kewpies found a way to make it right. This was the way that she believed--always make it right. That was her way. Maybe that's the part that is the children's story in it, and if if is, I hope I'm always a little girl. "When Rose came back after Meemie, her mother, had died she decided that she had traveled as much as she wanted to. And the place that she loved most in all the world, after her Castle Carabas, after her Villa Narcissus, after the Isle of Capri, after all these places that she had traveled--Japan, Europe, everywhere--there was no place that she loved more than Bonniebrook. This is where she lived. Her studio was on the third floor. That was her 'sanctuary.' She had a balcony where she could look at the cool sparkling brook, and a balcony where she could look at the beautiful forest and bluff. Through the open French doors she could watch the birds and listen to the frogs. She loved all nature. Bonniebrook was her retreat. After each trip, wherever she would go, she would always come back to Bonniebrook. I think that's what means so much to me, that of all the places in the world to live, she chose the Ozarks. I'm glad I live here." These Were the sentiments of most of Rose O' Neill' s Ozark neighbors. They loved and respected her as she did them. Miss O'Neill once said of her neighbors, "The people about us were like characters in delightful ballads and legends and we were delivered over to enchantment by them. Indeed we have never been about to get away from that first feeling that they were people of romance." Rose's first successful novel, The Loves of Edwy, was written after inspiration by these Ozark friends. In the "ragged rascal beauty" of the hills, it seemed to her that all these people lived in harmony like the Kewpies of Kewpieville. Rose O'Neill's mannerisms were considered strange by some along with the clothes she wore. She had a flowing and graceful style that was evidenced by her walking and also in her dress. She wore floor length mantles that had loose sleeves and a cord around her waist. This allowed her freedom of movement at her easel while she was working. The robes were red or maroon velvet. She wore sandals and polished her toenails. Both of these practices were against accepted standards of her time. But Rose was an individualist in all that she did. Rose Merritt said of her mannerisms, "She didn't distinguish between men and women in how she discussed endearing terms. In other words, if she felt like something was beautiful or you had done something wonderful she would say it just as affectionately to a man as she would to a woman, and some of the men misunderstood. This was her manner, it was her warmth, because she was effervescent and flowing and loving. The way that she would greet you would be for her to put her cheek to your cheek and give you what she called Kewpie kisses. Besides being a writer, illustrator, composer and poet, Miss O'Neill was also a sculptor, creating figures such as the "Embrace of the Trees" and "The Fauness." These works were considered vulgar and distasteful by people of her day. Rose Merritt related, "That was back in the days when they didn't show such things. 'The Embrace of the Trees' is a tree embracing a body, and the head is supposed to be part of the tree. Very modern, so far ahead of the day. Now today you'd see a thing like that and possibly never think anything about it, but in that day they thought it was gruesome. It is now in Midland, Michigan, and it is considered now to be one of her greatest creations.'" 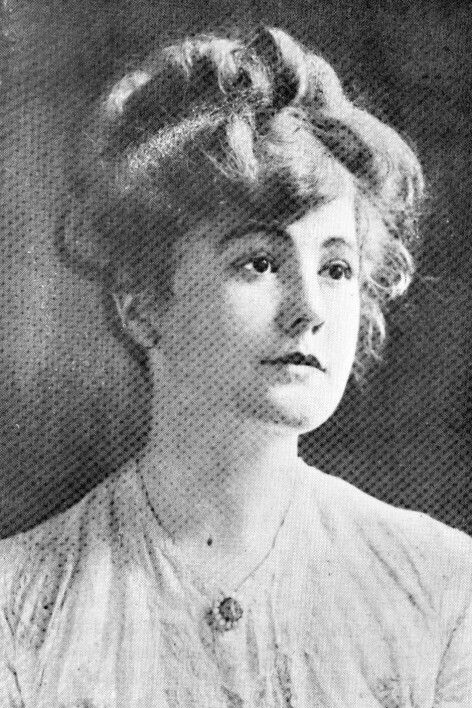 Rose O'Neill led an even busier life after 1912. Her second marriage ended in separation after five years. She was left very lonely and sad, and for the rest of her life spoke of her former husband as "The Beloved." The Kewpie first appeared in 1908, soon after the couple's separation. Rose spent much of her time in Europe, drawing Kewpies and illustrating for publications and advertisements. Also during this time Miss O'Neill bought a villa on the Isle of Capri from her father's friend. Along with this villa she later bought Carabas Castle in Connecticut. Her success with the Kewpies allowed her most of the luxuries she wanted. She furnished all the homes with priceless antiques and her own valuable art. Before World War I began in 1914 Rose and her sister Callista (now her business manager) returned to New York. The war stopped the importation of Kewpie dolls which were being manufactured primarily in Germany. Production of the dolls then began in the United States with materials such as celluloid, wood pulp and rubber. 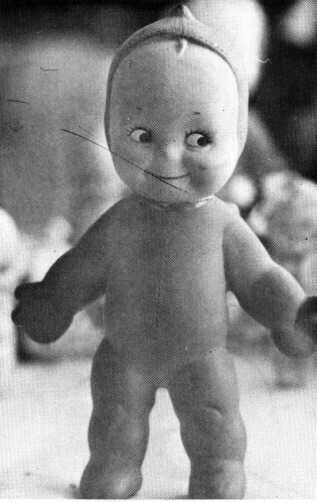 In 1925 the Kuddle Kewpies were born at the request of children longing for a Kewpie to hold and cuddle. They were made of plush fabric and stuffed with squeezable soft materials. 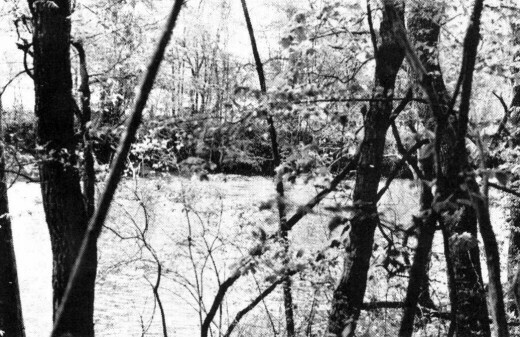 Rose's grave (along with other family members') lies in the tangled forest only a few yards from the rambling creek that she loved and named Bonniebrook. Returning to the Isle of Capri in 1929, Rose worked on her drawings and also finished two novels. She later came home to America during the Depression. Rose was burdened by the conditions of the time and almost stopped the Kewpie drawings, but for the children's sake she continued. In 1936 she retired to Bonniebrook to be with her mother at her death. The shock of her mother's passing left her with an emptiness in her life that couldn't be filled--she and her mother had been very close. Meemie was greatly missed by the entire family. After this tragedy Rose began writing her memoirs which have not yet been published. Her final attempt to make the world laugh was in 1940 when she created Ho-Ho, the Little Laughing Buddha. Being the God of Wisdom he had the "Supreme Wisdom of Laughter." He was to laugh all your cares away. This was Rose's last creation and not very successful. On April 6, 1944 Rose O'Neill died at the age of sixty-nine. She had suffered through a long illness which stole her strength and beauty. Her friends later marveled at the amount of work she accomplished in her short lifetime. By the volumes of work that Rose did it seemed she must have labored both day and night. "Oh, my, the work she did through the years," Rose Merritt reflected. "I don't see how any one person could have done that many things. To die as young as she did and still accomplish so much." She brought a spark of joy into a world full of the bitter hatred that followed the World War and Depression. Now Rose O'Neill is forever in that carefree world of Kewpieville where the Kewpies make everything right. 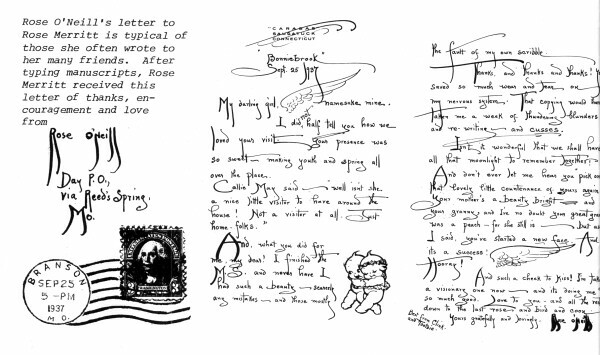 Rose O'Neill's letter to Rose Merritt is typical of those she often wrote to her many friends. After typing manuscripts, Rose Merritt received this letter of thanks, encouragement and love from. In more recent years the Kewpie enthusiasm has revived so that collectors and interested people began to see the need for some organization. Pearl Hodges of Branson, Missouri, was the first to take action, starting the National Rose O'Neill Club in 1967. The first celebration in Rose's honor held as a week long event in Branson in April, 1968, was called Kewpiesta. 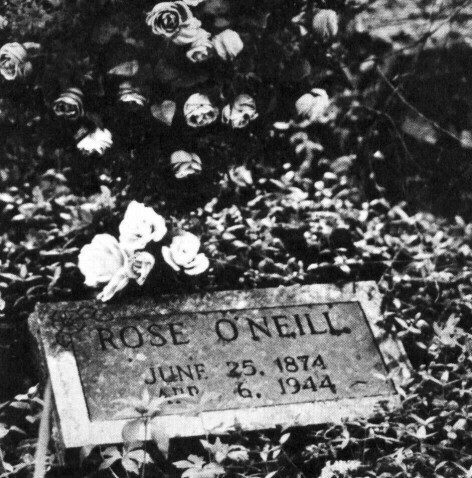 Membership in the club increased from nine members to six hundred enthusiasts in thirty states and four other countries, thus necessitating changing the name to the International Rose O'Neill Club. The members continue to celebrate Kewpiesta annually for a series of three days. People flock to Branson from all over the United States to honor the "one Rose" and exhibit their collections of Kewpies. The Shepherd of the Hills Farm Museum also has a room dedicated to Rose O'Neill which displays her Kewpie dolls, Kuddle Kewpies, drawings and other works. So the Kewpies still remain to bring joy to everyone and "make you laugh while they do good."